Equipped with a Z Axis, a spindle motor and a drill chunk, more powerful and ready to use. The spindle motor provides this kit stable and qualified power source. Solid drill chunk is stable, accurate and durable for connection for engraving bits with 0.3-4mm shank diameter. 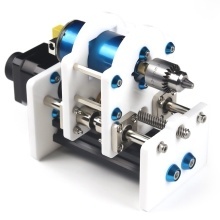 Perfect DIY kit to add an adjustable Z Axis to your engraver.